This morning, Motorola finally launched its storage-heavy Moto X model. 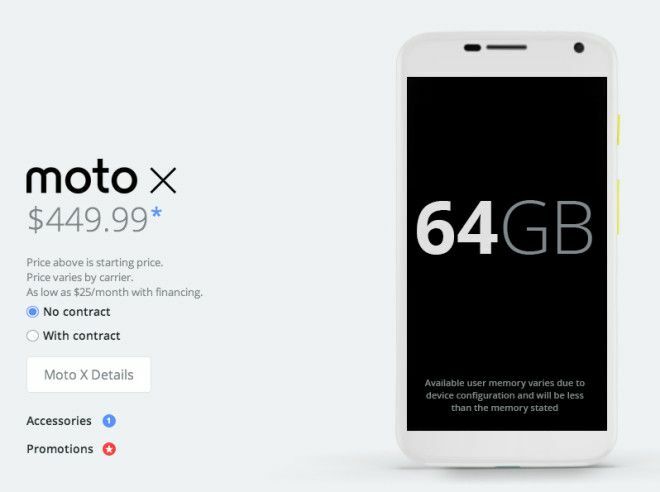 The 64GB model is now available to buy through the company’s Moto Maker tool online and costs $449, or “as low as $25 per month with financing” without a contract. Of course, a T-Mobile friendly version is available too. As with all other storage models, you can customize the phone to your liking by changing the accents, rear shell and main device color. Wooden backs are $25 extra. Initially when it was released earlier today, Motorola had launched a promotion whereby consumers could trial a Moto X for just $0.01. But, by the time the news broke, the Moto X phones allotted for the “Try Then Buy” were sold out. Regardless, the 64GB model is now available to buy, and hasn’t sold out – as far as we know. Motorola over the past few months has become one of the most discussion worthy topics. It announced its Moto 360 watch which – although huge – looks like the best-looking smartwatch we’ve seen to date. Add that to the fact that the company has been bought from Google by Lenovo, leading to an eventual shutdown of its US-based factory, and a likely disappearance of its Chicago office, and we have an intriguing company on our hands. ← SoftBank USA moniker chosen for merged T-Mobile, Sprint carrier? Would rather get a oneplus one if it were avaliable over that p.o.s. Got one for a penny to try. But also got a Z2 over on eBay through a daily deal. If they’re gonna make a new phone (for T-Mobile at least), they might as well enable that Band 12 LTE. There’s already a Moto-X variant that has it, the one for US Cellular, which is unfortunately cdma.